Robert Sullivan, Nga Puhi, is a poet and academic. 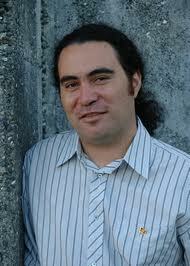 He is a significant internationally published Maori poet with seven collections of poetry released. His poetry is also widely anthologised. Sullivan’s writing explores dimensions of contemporary urban experience, including local racial and social issues. His writing has a postmodern feel, where history and mythology, individual and collective experience, become areas of refined focus. Sullivan’s work has won or been nominated for many awards. He is currently the Director of Creative Writing at MIT, Auckland.